This project aims to refine local mineral deposit and regional metallogenic models (the genetic relationship between the geological history and mineral deposits) in the Bridge River gold district by constraining the ages of mineralization and the host rocks. The Bridge River camp is BC’s most prolific gold-producing region, producing more than 130 tonnes of gold between 1892 and 1971. However, establishing effective deposit and regional scale metallogenic models for the Bridge River district has been limited by a lack of how and when mineral deposits were emplaced. Determining the most appropriate deposit and regional models can aid in identifying new exploration targets and re-affirm the credibility of the region as an exploration target. This project aimed to use a regional-scale program of data compilation, field examinations, and sampling supported with precise new isotope geochemistry to age deposits and assess how and when deposits were emplaced. ‘Orogenic’ gold deposits such as those found in the project area characteristically have high gold grades, focused mineralization, large vertical extents, predictable metallurgy, and modest environmental footprints. This area has more than 60 significant mineral occurrences and has included the Bralorne, Pioneer, Pioneer-Extension, Wayside, Minto and Congress mines. The data from this project helps to better understand mineralization and to better focus any future exploration activity. 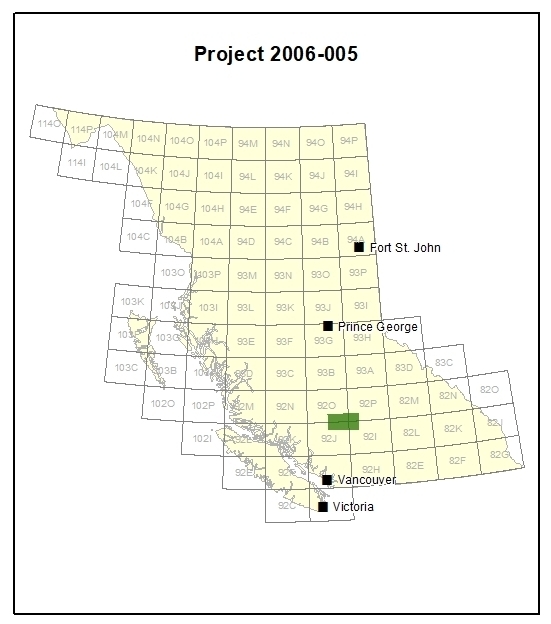 The survey area is near the town of Gold Bridge in southwestern British Columbia approximately 65km west of Lillooet and 55km north of Pemberton. It is in the territory of the St’át’imc Nation. Uranium-lead (U-Pb) and argon-argon (40Ar/39Ar) dating radiometric dating techniques were used to determine the ages of host rocks and gold deposits respectively. The project discovered that the main gold-forming event in this significant area was more recent than previously thought. The four dates identified indicate emplacement between 68 and 64 million years ago (Ma) within the Bralorne-Pioneer gold system. This timing complements other constraints, such as those determined by dating of pre-mineral and cross-cutting dikes. Mineralization in the adjacent antimony zone suggest that the veins are no older than circa 67 Ma. The Bendor batholith was emplaced at 65 Ma, and pre-dates to overlaps Bralorne-Pioneer mineralization, but related dikes exploit structures hosting some of the antimony zone veins. Faulting in this part of the Cordillera has resulted in gold mineralization at deeper crustal levels. Antimony, mercury and polymetallic (multiple ore) deposits occur across zones at shallower crustal levels. These patterns may be the result of the thermal regime associated with the emplacement of the mineralization, or there may have been subsequent uplift in the west to expose deeper crustal levels.